refers to the central zone of the stem, which is mainly made up of parenchyma cells. 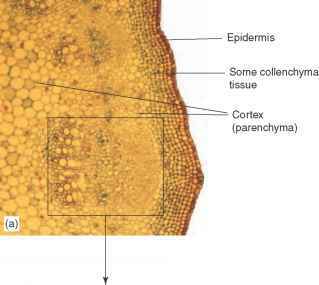 Collenchyma and sclerenchyma cells are usually found to the inside of the epidermis and are responsible for support in the young plant. Both tissues have cells with specially thickened walls. 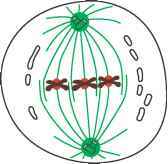 When a cell is first formed it has a wall composed mainly of cellulose fibres. In collenchyma cells the amount of cellulose is increased to provide extra strength, but otherwise the cells remain relatively unspecialized. 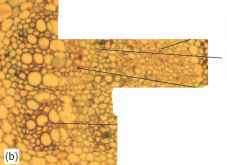 In sclerenchyma cells, the thickness of the wall is increased by the addition of a substance called lignin, which is tough and causes the living contents of the cell to disappear. These cells, which are long and tapering and interlock for additional strength, consist only of cell walls. Figure 6.4 (d) A comparison between the stem tissue of monocotyledons (Zea mays) on the left and dicotyledonous (Helianthus) on the right of water results in the partial collapse of the parenchyma cells and this becomes apparent as wilting. Parenchyma cells also carry out other functions, when required. Many of these cells contain chlorophyll (giving the stems their green colour) and so are able to photosynthesize. They release energy, by respiration, for use in the surrounding tissues. In some plants, such as the potato, they are also capable of acting as food stores (the potato tuber which stores starch). 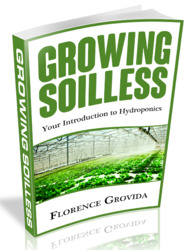 They are also able to undergo cell division, a useful property when a plant has been damaged. This property has practical significance when plant parts such as cuttings are being propagated, since new cells can be created by the parenchyma to heal wounds and initiate root development. 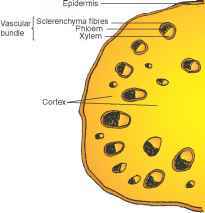 Contained in the cortex are vascular bundles, so named because they contain two vascular tissues that are responsible for transport. The first, xylem, contains long, wide, open-ended cells with very thick lignified walls, able to withstand the high pressures of water with dissolved minerals which they carry. The second vascular tissue, phloem, consists again of long, tube-like cells, and is responsible for the transport of food manufactured in the leaves carried to the roots, stems or flowers (see translocation). The phloem tubes, in contrast to xylem, have fairly soft cellulose cell walls. The end-walls are only partially broken down to leave sieve-like structures (sieve tubes) at intervals along the phloem tubes. Alongside every phloem tube cell, there is a small companion cell, which regulates the flow of liquids down the sieve tube. The phloem is seen on either side of the xylem in the marrow stem, but is found to the outside of the xylem in most other species. Phloem is penetrated by the stylets of feeding aphids (see Chapter 14). 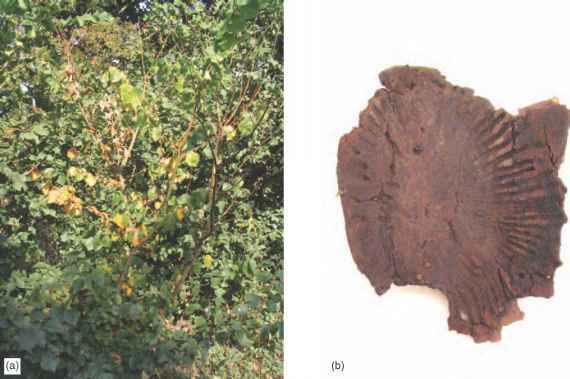 Also contained within the vascular bundles is the Figure 6.5 A shredded leaf of Phormium tenax cambium tissue, which contains actively dividing cells producing showing fibres of xylem tissue more xylem and phloem tissue as the stem grows. What are the number of florence's in a dicotyledonous plant? What is the central tissue of parenchyma cells in dicotyledonous stems? 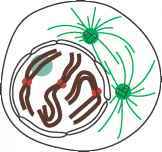 Which diagram in figure 6.3 shows the process of mitosis? Is protoxylem present in a young dicotyledonous stem? 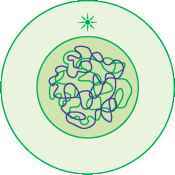 Which diagram in figure 6.3 shows the process of meiosis? Is the sclerenchyma fibres within vascular bundle? 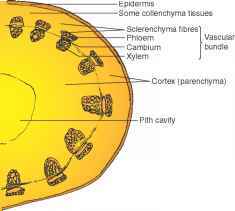 What is the central tissue of parenchyma cells in dicotyledonous stem? What the following cross section of a dicotyledonous Stem? Why is collenchyma the first supporting tissues in young dicotyledenous plants?